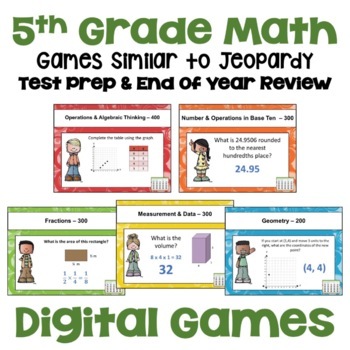 Are you looking for and fun and easy way to review all the 5th grade math Common Core topics with your class? This is it! This product has 2 different PowerPoint Review games. 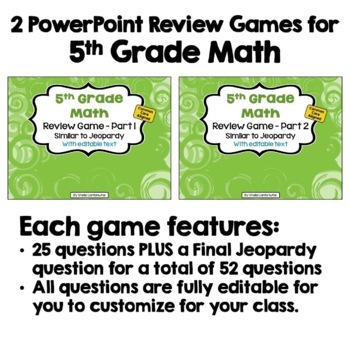 Each game has 25 questions (5 questions for each of the 5 common core strands) PLUS an additional final jeopardy question for each game. Students will have lots of review and they’ll have tons of fun playing this jeopardy like game. Plus, all the text boxes are editable so you can customize all the categories and questions for your class. Each category has 5 questions ranging from 100 points (easiest) to 500 points (most difficult) for each of the 2 games. 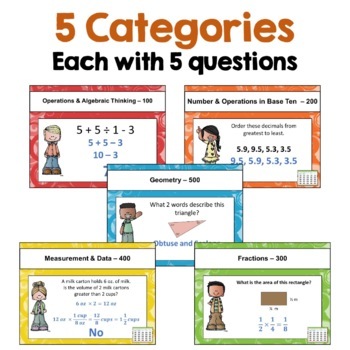 Categories and questions are editable so you can customize for your class. You can use the questions as written, change a few, or completely customize to your needs. It’s totally flexible. Questions are linked back to the interactive game board to make it easy to navigate. 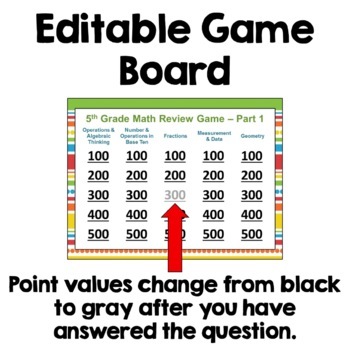 Once you visit a question, the link on the game board will change from black to gray to let you know that you have already used that question. There is also a final jeopardy question for each of the 2 games. Instructions on how to use the file are found in the notes of Slide 1 of both games. Common Core Alignment is found in the notes section of each of the slides. This is an editable PowerPoint 2010 file so you will need to have PowerPoint on your computer. The text boxes are all editable (categories, questions, and answers) but the design elements are secured and not editable.